Great protection and looks! Now there is a luxury coach quality tow & back guard available for your motor home or tow vehicle. Ultra Guard helps protect your towed vehicle and back of coach from chips, scratches, diesel oil and road grime. Its one piece design is made of a specially formulated blend of rubber and nylon cord with anti-sail stiffening ribs molded in to it. Ultra Guards attractive appearance will also enhance the looks of your coach. 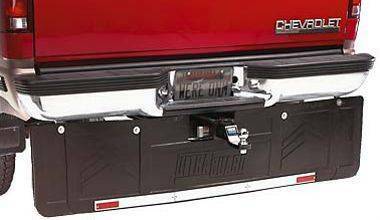 It easily attaches to the bumper or frame of the coach using a standard piece of steel angle (not included) and has an optional cut-out panel to accommodate hitches, wiring, chains etc.